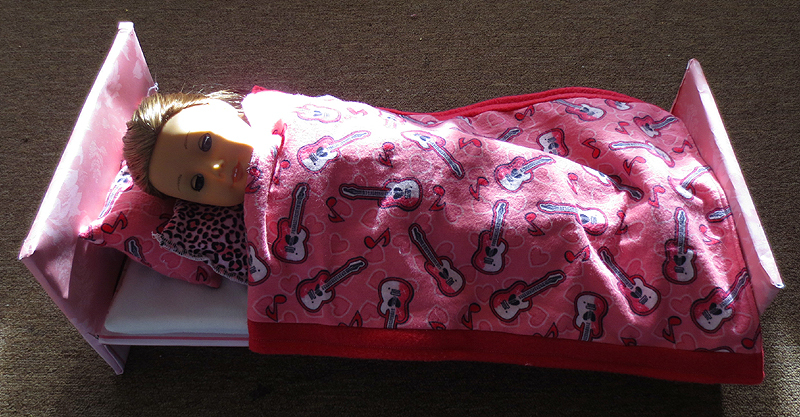 With a little inspiration from My Froggy Stuff, my daughter and I made an 18 inch doll bed. The bed itself is made entirely from recycled paper/cardboard, a few sheets of scrap paper, and glue. The bedding is made from fabric scraps and old pillow stuffing. We started with some heavy cardboard and empty cereal boxes, broke them all down flat and cut out several pieces in the sizes we needed. For the headboard we cut 10in x 8in pieces, for the footboard we cut 10in x 6in pieces, and for the bed we cut 20in x 10in pieces. We then stacked and glued each size together with some watered down tacky glue using the heavy cardboard in the middle and stacking the lighter cardboard on each side of it. We let these dry overnight. When dry these created sturdy boards to hold the weight of a doll. My daughter then picked some scrapbook paper she liked and wrapped the head and footboard like a present gluing the paper down as she went. 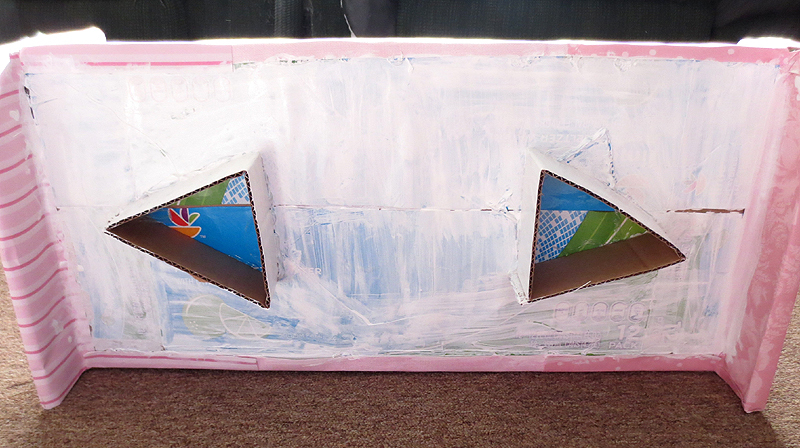 We then glued down some scrapbook paper across the flat part of the bed and glued it securely to the bottom. I hot glued the headboard and footboard to the bed part and reinforced the seams with an extra line of hot glue. To help keep the bed from sagging we cut strips of heavy cardboard the height of the bed, shaped them into triangles and glued them to the bottom of the bed with hot glue. Then we painted the bottom white to help hide the printed cardboard. 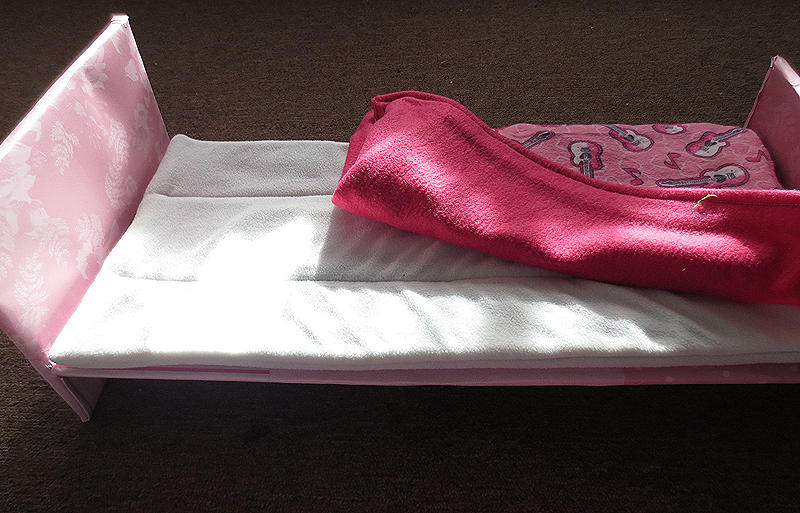 The “mattress” is made from 4 layers of scrap fleece sewn together, turned out with 2 rows of stitching down the middle to keep it from shifting should it need washing. 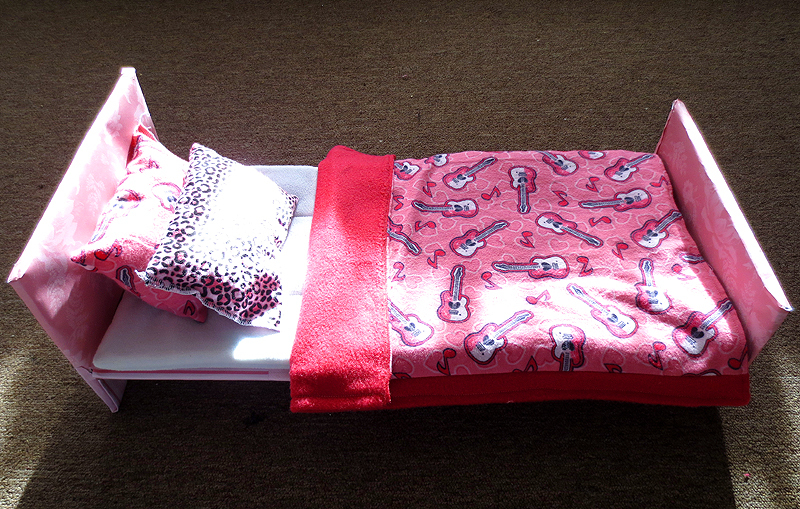 We made 2 pillows and a blanket out of flannel and fleece from my scrap bag and that’s it! Easy peasy! Go make one!